FORT WORTH – Today, the nation’s largest state medical society and one of the largest patient-advocacy groups united to stop the Medicare Meltdown. This is the first time these two immense patient-advocacy groups have joined forces to ensure Texas’ 3 million Medicare patients receive the care promised by the U.S. government. 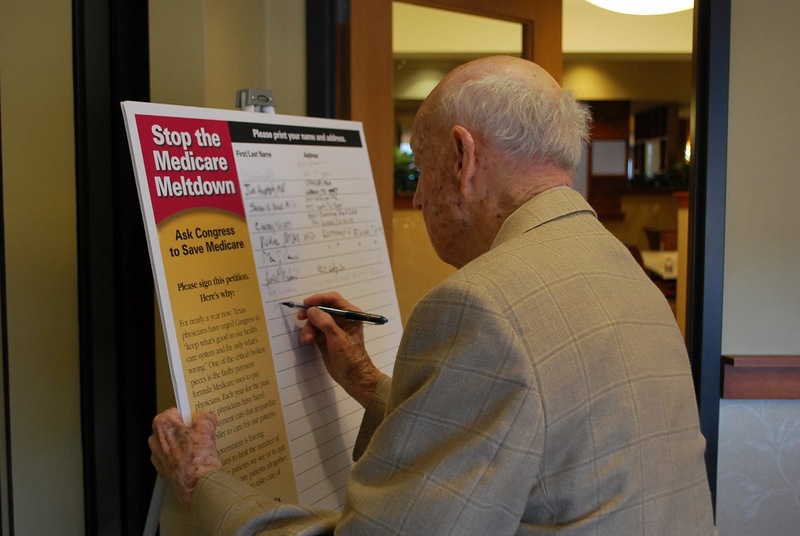 Texas Medical Association (TMA) physicians, AARP representatives, and more than 30 patients gathered at the Trinity Terrace Retirement Community in Fort Worth, Texas, and called on Congress to fix the crisis. Texas patients picked up their phones and asked their U.S. senators and representatives to stop a 23-percent cut to their physicians’ Medicare payments scheduled to go into effect Dec. 1. The cut grows even larger after the New Year. “I can’t believe we are here again, for the fifth time this year, asking Congress to stop another drastic cut to physician payments,” said TMA President Susan Rudd Bailey, MD. Watch the video excerpt below (it will automatically right itself!) and read the full story.